The holidays are over. The cookies are gone. The desserts have been devoured. All that remains is one muffin top…mine. Don’t get me wrong, I had a lovely holiday. I visited with friends and family, and I didn’t go crazy with my eating. But…by Christmas day, I felt terrible. In fact, was tired most of December. My energy level was way down from normal and I had the blues a bit, especially after Christmas. Maybe some of that was just normal post-holiday emotions, but I think a majority of it was from my diet that was consisting of more starches and sugars than what I am used to eating. Also, about a year ago, I noticed a small lump along my bikini line which scared the daylights out of me until I did some research and saw a doctor and found out I have a femoral hernia. It’s a rare type of hernia that occurs mostly in women and can be caused by pregnancy. I was relieved that it wasn’t anything more serious. I noticed that when I eat too much, my gut really bothers me. I had an episode just after Thanksgiving that almost sent me to the hospital. If you have ever had intestinal pain, you will know what I’m talking about. I almost passed-out, was throwing-up, and then broke-out into hives, all from pain in my gut. I did some research on hernia surgery and thought I was going to have to have surgery right away to avoid another emergency situation. Then I stumbled upon some websites that examined healing a hernia without surgery. Being the crunchy girl that I am, I figured it couldn’t hurt to try. General anesthesia scares me to death! If I’m going to have surgery, I would rather it be for a tummy tuck than to fix a hernia! But I’m probably too chicken for that, too. I also read that, contrary to common medical advice, moderate exercise, including abdominal strengthening, can actually help to heal a hernia (depending of the type and severity). I was training for a sprint triathlon last year and stopped my training, in part, because I was afraid I was going to make it worse. I plan to start Pilates and yoga from home and I am going to resume walking/jogging and swimming. Reduce the overall quantity of food you eat. Eat mostly foods which are easily digested and pass quickly through your digestive system. These help to reduce the amount of time food stays in your intestines (‘transit’ time), and make bowel motions soft and easy. Eat foods which help to reduce gas and lubricate your intestines. Eat foods rich in nutrients which help to maintain the integrity of collagen and elastin in your abdominal wall. Consider eating only two meals a day instead of three. Skipping breakfast means your intestines should only contain one meal’s worth of food by lunchtime. This greatly reduces the volume of your abdomen and the pressure on your inguinal gap. After reading this, I thought, raw food fits the bill here for sure. I knew I needed to get flour and sugar back out of my diet, and I needed to cut-out meats and cheeses for a while because they are digested too slowly. I try to get my vitamins and minerals from food sources whenever possible, and the best Vitamin C source I have found is a 100% food concentrate from Acerola Berry. 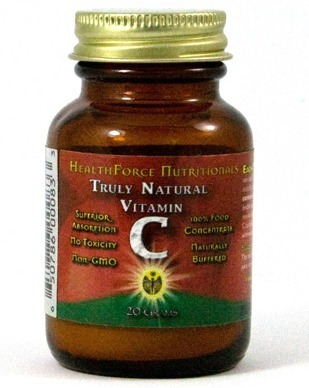 I use Healthforce Nutritionals Truly Natural Vitamin C. I just add a tablespoon to a green smoothie. Since I’m not eating meat, I have included nuts and seeds in my diet as well as an L-Arginine supplement. Nuts, together with sunflower and sesame seeds, are the best all-round sources of zinc, copper, calcium, magnesium and arginine–nutrients which your body needs to make collagen for strong connective tissue. 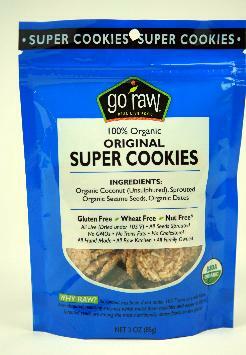 I am adding sunflower and pumpkin seeds to my salads and am snacking on Go Raw’s Super Cookies, which are made with coconut, sesame seeds, and dates. That’s it. They have other flavors too, but I have only tried the original so far. My kids love them too. When I have some time, I’m going to make some myself. I have a super recipe for raw cookies with sprouted oat groats, raisins, and cinnamon. I admit, it sure helps owning a health food store. I am able to try things, often for free from companies and see if they taste good and test how they work. I will be trying lots of new products and let you know what I think. So, where to start? I started with green smoothies. 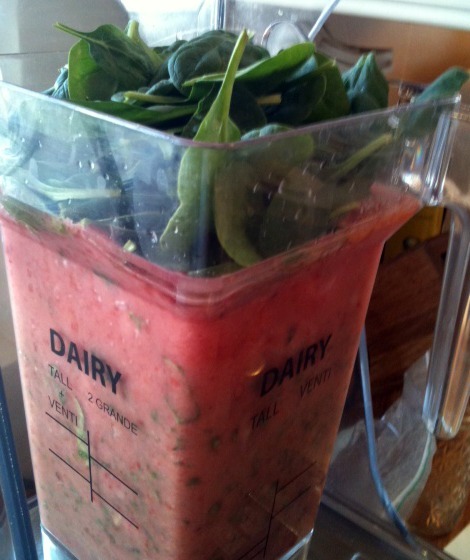 Today I used frozen bananas, frozen strawberries, coconut water or spring water, and TONS of spinach. The BlendTec sure helps. My regular BlendTec is at the store, so I ordered this refurbished Starbucks blender on Ebay. I prefer mine over this one. 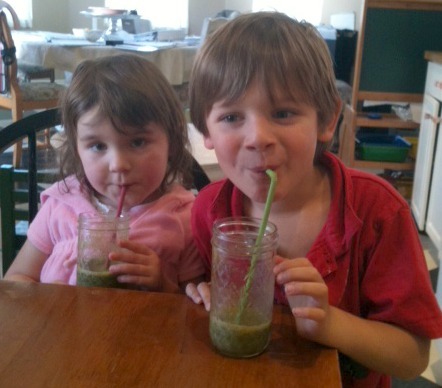 Here are my kids enjoying their smoothies. As a mom, I can’t do anything on my own. Everyone wants to join in. I guess that’s a good thing! RawFamily.com has some great green smoothie video demonstrations if you are not sure how to make a green smoothie that actually tastes good. I’m getting ready to make some videos of my own, so keep checking back. I’ll keep you posted about my raw food resolution. My plan is to continue eating raw for about three weeks. At that point, I will re-evaluate my progress.